It is shameful that the demonization and criminalization of Muslims, particularly Muslim women, is still so popular. A defaced pro-refugee sign in Montreal. On Wednesday, Bill 62 became law in Quebec. The bill requires those giving or receiving public services to have their face uncovered. In practice, this means that, for example, it will be illegal for women who wear niqab to take the bus. The bill was passed by a vote of 66 to 51. The margin may seem somewhat close, but take this into consideration: all of the 66 who supported the bill were members of the Liberal Party, and many of the opposing votes wanted something that would place even harsher restrictions on religious minorities, particularly Muslim women. You're going to see a lot of different justifications and defences for this soon, so I want to quickly debunk some of them. I'm sure I will write more about this issue in the near future. Notice that wearing a cross is allowed, while wearing a hijab, turban, niqab or a yarmulke is prohibited. The bill is supposedly part of the Quebec government's position of religious neutrality. Proponents of the bill will go through Olympic-level mental gymnastics to try to argue that the state targeting a religious minority — one that is the victim of an increasing number of hate crimes throughout the country — is somehow an example of neutrality. In reality, the bill is "neutral" in name only. It originated due to Islamophobia, the campaigns surrounding it over the years have hinged on using Islamophobic imagery and rhetoric, and if it is truly enforced, Muslim women will be the main targets. In previous attempts to get this bill to pass, there wasn't even pretence of neutrality. For example, take this 2013 guide to how the bill proposed at the time would be enforced. Notice that wearing a cross is allowed, while wearing a hijab, turban, niqab or a yarmulke is prohibited. 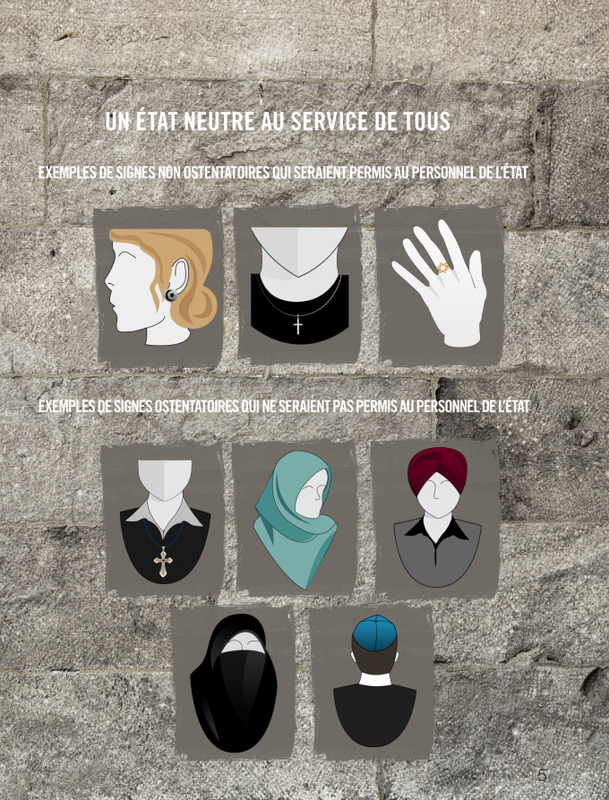 A page from a PDF document released by the Quebec provincial government on Sept. 10, 2013 that shows acceptable symbols (top row) for provincial employees to wear, and non-acceptable symbols for provincial employees to wear (bottom two rows). Some will argue the bill will be useful because it will lead to supposedly oppressed Muslim women being freed by taking off their niqab. This presumes there is widespread oppression of Muslim women in Quebec unique to what other women in the province face, and unique enough that it requires special action from the state. This isn't borne out by evidence. Also, you can't gauge if someone is oppressed simply by examining what they choose to wear. It punishes the women who the state believes are being oppressed by men. But let's take this argument at face value and assume there really are legions of women out there being forced to wear niqab. How will this bill solve that problem? It is unlikely that these men, who have supposedly forced women to wear niqab, will suddenly change their minds because of the bill. It's also important to remember the bill is not even aimed at these men. Instead, it punishes the women who the state believes are being oppressed by men. So if the bill is put into effect, and the men supposedly forcing Muslim women to wear the niqab don't change their minds, what happens next? The bill will prevent these women from acquiring services vital to obtaining independence, from using public transport to writing exams. So now, the state has made life worse for the "oppressed" Muslim women they supposedly wanted to liberate, as well as for the countless others who wear the niqab by choice. Other people will argue that the bill was drafted due to safety reasons. If there is any evidence that preventing a Muslim woman from writing an exam, or working, or riding the bus, will increase safety — show me. It's actually more likely that the bill will make Quebec less safe. In reality, supposed concerns about safety are almost always a cheap and mostly see-through mask used to disguise bigotry. We have more than a decade of examples of cases where we've seen this be true, including Sikh officers fighting to have the right to wear their turbans on the job, and girls who wear hijab being barred from playing soccer. It's actually more likely that the bill will make Quebec less safe. This will certainly be true for the Muslim women who will inevitably be on the receiving end of more hate crimes due to the bill emboldening Islamophobes across the country. The most recent Statistics Canada hate crime report noted that since 2012, reported hate crimes against Muslims have already risen by 253 per cent. As mentioned, one of the public services affected by the bill is public transportation. If a woman who wears a niqab does ride a bus, will the driver be in charge of enforcing the law and monitoring other violations? There are already enough crashes involving buses. Requiring the drivers to be distracted, or inadvertently causing them to be by the likely increase of hate-motivated incidents on buses, will only make things worse. 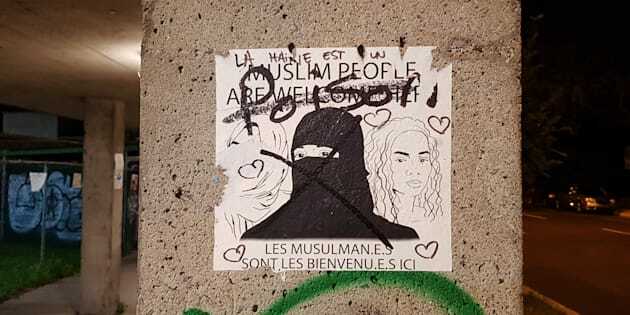 It is shameful that the demonization and criminalization of Muslims, particularly Muslim women, is still so popular in Quebec and much of the rest of the country. It is even worse that politicians are willing to capitalize on this hate instead of stand against it.